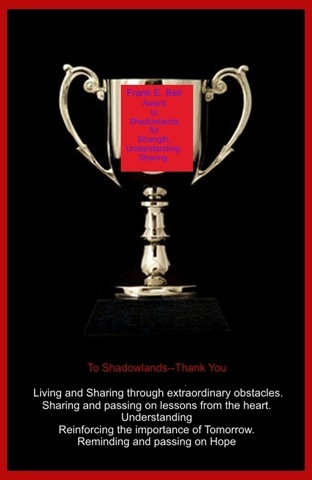 Yesterday, Shadowlands not only gave me awards, but described my blogs in the most complimentary way. During the time before my Mother died I had received a couple of other awards. At that time, my days and nights were clouded and I didn’t always have the time to acknowledgement the kindness shown me. So, imagine you are now walking out of your home dressed in some fine, formal garb, hair and nails freshly fixed or if you are a guy you have trimmed your moustache and put on your patent leather dress slippers, tux and red silk bow tie!! Sure, if you are very creative you can already see the dinner table set at the awards with a black faile cloth to the floor, Baccarach glasses, sterling silver flatware, silver opera chairs with black cushions and a breathtaking arrangement of multi-white roses and white dendrobian orchids in the center of table. Since this is a fantasy, just order whatever you want to eat. Relax and enjoy every tender morsel of tenderloin, lobster, rack of lamb or other special dish that you want. Carefully pat your lips, sit back because now you are to receive your awards. The awards for this occasion are yours and need nothing else done, except to realize how special all of you are!!! Without your support my blogs would never have been recognized on Technorati or WordPress, but your support went much further than having my blogs on Technorati. I have been touched by Shadowlands’ strength and courage and ability to give me her time when my heart was hurting so badly. She walked me through the darkness one feels in the beginning of grief and guided me so that I understood that grief has many paths and many parts to travel through. We each are still journeying to the day we will feel more settled and secure in our feelings. God provided her with many talents–writing is one, but compassion for others is paramount! Is thank you enough? During those first days in November I always went back to the computer to the blog surfer checking to see if Linda had posted. Her stories, particularly about herself or EmmaLou brought a smile to my face, regardless of how grey I felt the day. 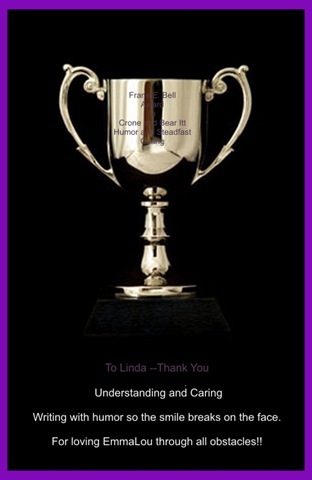 I am sure there were times she was busy at school, but whenever I could post a poem or thought Linda answered with her support and love. Thank You. And one day I went to see Sparkle and from that moment I learned about her life which parallels mine. One day I realized Sparkle was grieving for the Mother she never had, while I was grieving for the special Mother I had. Together we have compared our feelings and walked down a path of grief with a special understanding for each other. During that last week of my Mother’s life and on from there Lynda sent me many emails letting me know she was there and praying for me. I am in awe of her and the rest of you because without your prayers life may have not been so good. Lynda is unbelievably accepting of people and opens her heart to them. She takes some great photos–I miss seeing them on her blog, but she will begin again when she can. 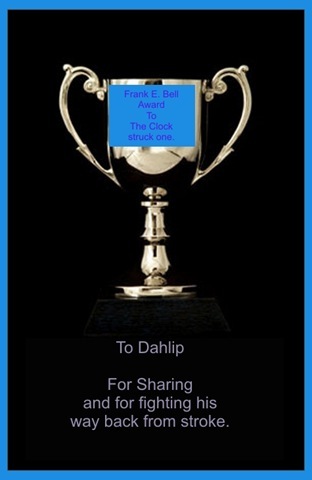 Early on I found “The Clock Struck One”, Dahlip’s success at sharing his story about how his life changed after his stroke. He writes truthfully and tries also to include helpful hints for other stroke victims. He is to be applauded for his work. If you haven’t visited his site, please do so…….there may be a day when you can suggest to a stroke victim to visit his site. His story paralleled my Mother’s thoughts and fears after she had her major stroke. She was happy to know some one was trying to tell people how stroke can cause you to feel alone, depressed and worthless, but that there are ways for coming back and having a life. Oh, yes, sometime soon you will have dessert. Use your imagination again, or better yet go to your kitchen and whip up a souffle. EmmaLou is waiting for hers Linda!! 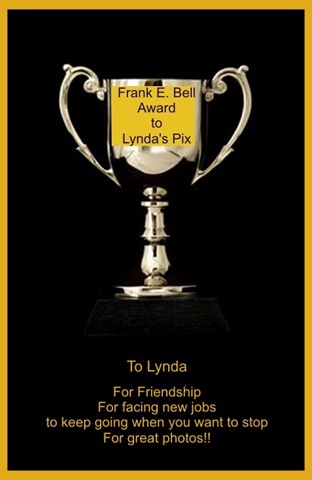 Posted on January 9, 2009 September 5, 2010 by suntithenaiPosted in award, giftTagged blogging, friendship. I do hope EmmaLou had a bow and a special bone!! Yes, we are all very lucky, especially me!! Now, have a real, great dinner!! I am humbled and amazed to be the company of the Frank E. Bell Award recipients. I admire each one for their talents, especially, yours my friend. I wanna, wanna get in a tuxedo with a faile lapel, a white silk hankie, an English silk and cotton dress shirt, my jade studs and cuff links, my patent leather handmade slippers from Brussels, a white long scarf to the knees and a red silk bow tie…….ah yes and a little hair on top of my head, a very tight girdle and we are off to an evening of glamor. I really would like to stop in New York for a Cappucino and pastry after dinner, let’s see in this really wonderful restaurant for dinner in Acapulco. Now my only problem is getting the plane to take us!!! Well maybe it could be a little simpler like half way between your house and mine or more your way if they is a great place or more my way so then we have to go to Chicago. Boy do I know places to go!! Enough, Enough, Enough!!!!!! Yes, buying clothes is fun. But, as you all say, knowing each other is better!! Frank, I had no idea…THANK YOU!! I’m sorry I haven’t gotten over here as often as I would like. I’ve missed reading your posts. Life is so rude for getting in the way of what I’d rather be doing. Truly, I am touched by your words and so very honored by your description of me. It is sometimes difficult to see myself the way others see me. I thank you from the bottom of my heart. You are a mirror that I always enjoy looking into. I have started posting some photos on my blog again and hope you’ll stop by when you feel up to it. It’s about time for me to get out and take some more, but I’m having fun with the creative side of things right now! Let me know what you think. Lynda, it is easy for me to write the truth…….I only said what was true. Yes, I noticed the first flower………gotta check out if there is another. Don’t worry if you fall behind in posting, I have and I find out everyone is still there–like you!! Isn’t it amazing that somewhere out there in the cyber world, we find friends that truly understand? In some respects they become truer than our “close by” friends, as they know much more about us, from reading our blogs. I know I am a great deal more transparent inmy blogs, than I could ever be face to face. Through all the journeys we read about, we learn so much, and grow, and realize that we need each other. Oh, Sparkle, you are so right about being on a blog. I consider myself a blabber mouth to someone I really like, but in the world I have few very close friends…….but here I have more and they are terribly special to me. Whenever I think of the times I saw your name on Shadowlands and never came to visit. Well I could give me a kick because we do have much in common and you do understand me so well. But at least we have made it to get to know each other. And I know that if we do meet we don’t have to waste that time telling each other our story. We can just go on from where we are. I don’t think that people are that much different in real life as they are in cyberspace. Well sure, some can be making it all up, but I can’t believe thatthere are many like that!! It is a thing of wonder to me because before my blog I always distrusted the internet and now it has all my closests friends. Well life goes in strange ways.